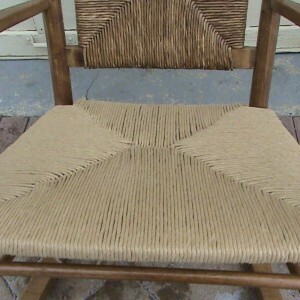 All types of chair caning including both pre-woven and hand-woven caning, blind caning and rush work. Furniture repair, including hand stripping and hand-rubbed antique oil finishes. Re-gluing and veneer repair as well. Wobbly chairs and tables are a specialty. Dull or worn finishes can be “refreshed”. Contact me with any questions and for a listing of prices. Usually a photo will be helpful in determining exactly what your needs are and allow me to give a better estimate. Pickup and delivery can be arranged. 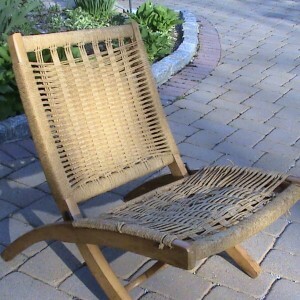 I had a wicker rocking chair seat repaired. James did a beautiful job and re-stained the entire chair. I was very happy with his work. Jim replaced the broken caning on one of our dining room chairs. Excellent job done within the described time line. I highly recommend Jim because of his work, his personality, and his great recommendation for a lunch place for my wife and I. Excellent job by Jim. It was a pleasure doing business with Jim from start to finish. 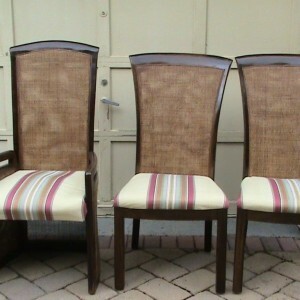 His quote was very clear and he found the exact cane for my dining chairs and finished on a timely basis. An excellent job! Jim did an amazing job restoring my kitchen stools. He truly is a master at his craft. Along with his fine work, Jim was very organized and punctual. I’d recommend jim in a heartbeat! Jim is honest, well-priced and meticulous with his work. I keep going back for more. 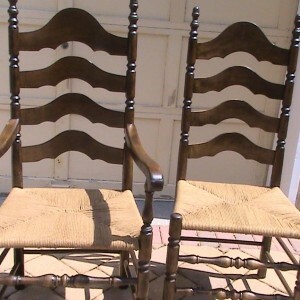 Jim did a wonderful job recaning and repairing my dining room chairs – they look great! Not only did he replace the caning but also expertly repaired one that the dog chewed. Jim was a pleasure to work with and very professional. He finished the job ahead of schedule and within budget. Thanks, Jim – you are the best! Jim replaced the broken seat of my bentwood rocker. It looks great, he even dyed it to match the rest of the chair. I’m very happy with the result, especially because I’ve had the rocker a long time and did not want to lose it. Also, Jim was a delight to work with, very friendly and helpful! Thank you, Jim! Jim re-caned four chairs, and later repaired one leg from that set. I had no idea how comfortable that new cane would be. I would highly recommend Jim to anyone–the work is really excellent, and Jim is really a craftsman and a gentleman. The chairs came back newly caned and nicely polished. I am so fortunate to have found Jim for my furniture repair. I had a pair of end tables with cane shelves. The bottom shelf on both tables had been damaged in a move. One looked like someone kicked a hole in it. Upon inspection Jim realized that the caning was hand done which is much more labor intensive and he was up to the task. It took him many hours but was able to complete my job in a timely manner and the tables are just beautiful!!!! Jim is very meticulous with his work and wonderful to work with. Re-caned the seat of an old Bentwood rocker. Results were amazing, Jim stained the new caning material to match the back and it looks fantastic! 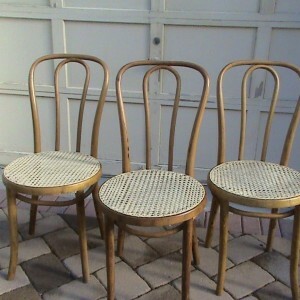 Jim put machine caning on four sidechairs. It looks great, and he was easy to deal with. Beautiful work, reasonable price, lovely person! Thank you for fixing my chair! Jim did a great job replacing the cane on my in-laws chair…everything done perfectly, and on time. He is a real craftsman who really cares about his work. Furniture Refinishing Verified Review Fantastic!!!! 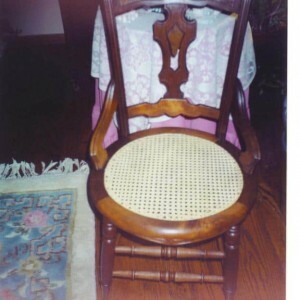 Jim worked on 2 antique chairs that needed the rush replaced and needed to be re-glued since they were wobbly. Upon initial inspection while I was present, he noticed that one of the wooden seat rails was broken. 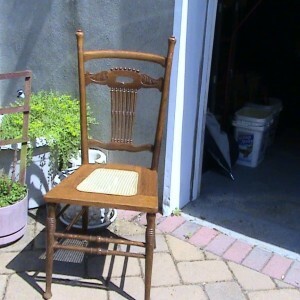 He also offered to revarnish both chairs. Prices and time to complete the work was all very reasonable and as quoted. Jim did a great job and both chairs look fantastic. I was very excited to find Jim! 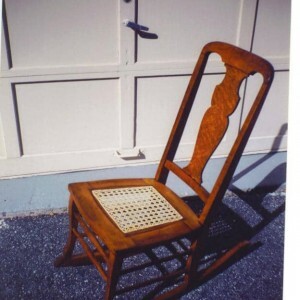 I had two chairs – one with a cane seat that belonged to my grandmother and the other was an old porch rocker with a woven splint seat. Jim repaired both beautifully. They are back in my house receiving plenty of compliments. Thanks Jim! Jim did a great job on my mother’s heirloom rocking chair. 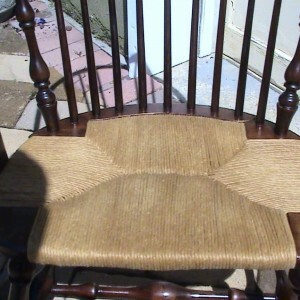 He restored the cane seat and stained it to match the back. She absolutely loved the results! He delivered earlier than promised and the price was fair. I will definitely use him again. Jim, Thank you for Caning our chairs. You did a beautiful job and in a very timely manner. We appreciate it so much. 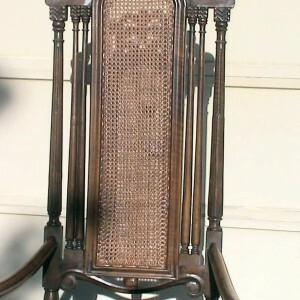 We had a chair seat re-caned that had previously been re-caned by someone else. He repaired and reinforced the spline groove and re-glued a loose joint. The staining was a good color match. A fine job. Jim is now working on restoring 4 hardrock maple chairs for us. Jim completed the re-caning of a bar stool for me that required some staining in addition to the caning. The work that was performed was impeccable in quality and looks as if it was, when originally purchased 30 years ago. I appreciated the fact that he followed-up with me regarding the progress being made with the chair and that the end result was good value for a job well done. Jim re-caned the back of my dining room chairs. The chairs came out perfect. The new backs perfectly matched. I would highly recommend him. James was outstanding! Picked up on time, dropped off on time, and did a wonderful job! A. Lately I’ve been doing lots of caning jobs, both hand woven and prewoven cane. Refinishing furniture seems to be more in demand as the weather gets warmer. A. Ask questions of the provider to determine if he can address exactly what it is you want done. Good communication between parties will help to satisfy the potential customer and make for a successful transaction. A. 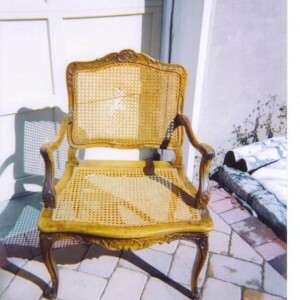 Furniture repair and restoration is a labor of love. Each piece I work on is treated as if it were my own. I don’t take shortcuts and am only satisfied when the customer sees the quality of the final product. Today’s furniture does not compare with the furniture of yesteryear. Most pieces can be made to look like new and provide many more years of useful service and enjoyment. A. How long have you been involved in furniture refinishing and repair? What’s the difference between hand woven and prewoven caning? Can caned seats be repaired? 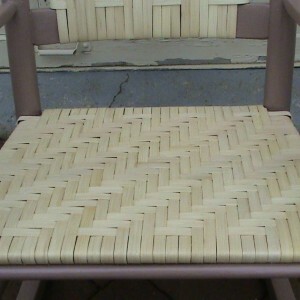 Can caned seats be stained to match? A. Each and every job I do is done as if the item were my own. I put a great deal of time and effort into any job I take and don’t consider the job done until the customer is completely satisfied.